Apples, pears, cherries, and plums produce their best fruit on two- to three-year-old wood. Peaches bear their fruit on the last year's vegetative growth. One of the prime reasons for annual pruning is to encourage lots of productive fruiting wood—one-year-old wood on peaches and two- to three-year-old wood on the others. Unpruned trees can quickly become unproductive, while 70-year-old fruit trees can still bear lots of fruit because annual pruning promotes the right amounts and kinds of growth. Annual pruning keeps trees productive. 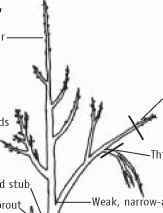 example, when you cut off buds while pruning the tip of a branch, you release dormant buds farther back on the branch, which grow and produce new branches. The effects of plant hormones are greatest on vertical shoots and least on horizontal limbs. 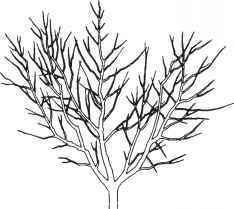 Spreading branches from vertical positions so that they are nearly horizontal has an effect similar to that of pruning off the buds at the tip of the branch. This spreading promotes new shoot development, initiates fruit buds, and slows the extension growth at the branch tip. 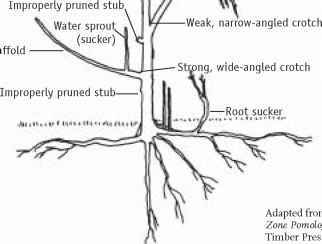 That is why most fruit trees are pruned and trained to produce horizontal branches that yield more fruit, while much of the vertical growth is pruned out of the tree (see Figures 3 and 4). Figure 3. 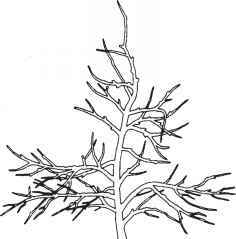 When pruning and training a young tree, it's important to keep in mind the form of the mature tree. Note the central leader and conical shape of the apple and pear trees and the more vase-like shape of the peach and cherry trees. Figure 4. 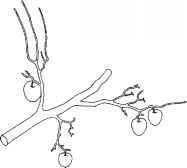 Horizontal branches produce more fruit. The upright branch produces lots of vegetative growth but little fruit. What fruit it does produce is often soft and poorly colored. 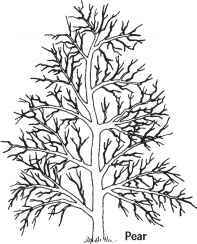 The branch growing from the underside of a larger branch is heavily shaded. As a result, it produces little vegetative growth and small fruits of poor color. 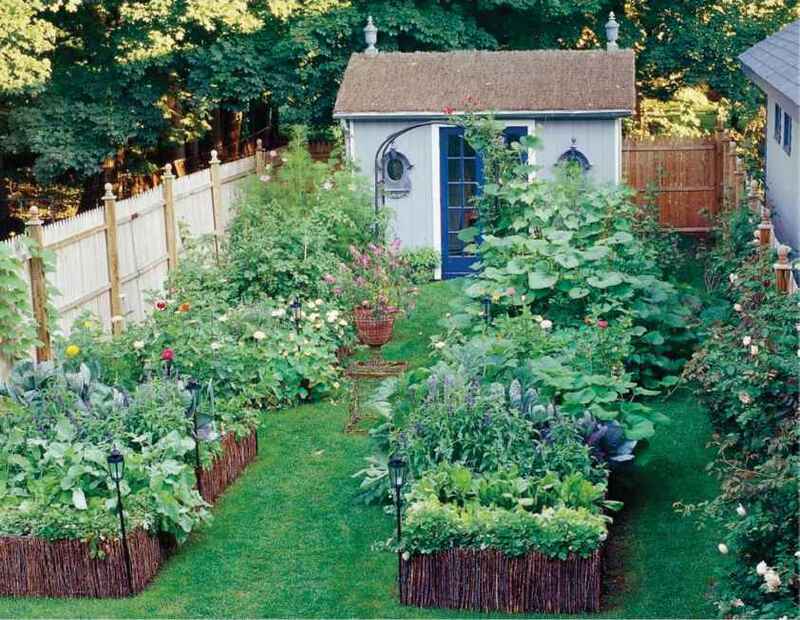 Therefore, prune to encourage horizontal branches. They produce moderate vegetative growth and are very fruitful. Because of good light exposure fruits have better color. The other reason for encouraging horizontal growth is that branches with narrow crotch angles—where the angle formed between a branch and a vertical leader is less than about 60 degrees—are weak and break more easily under the weight of fruit. Narrow crotches also can serve as an entry point for organisms that cause disease and decay. Each growing season, the diameter of each branch enlarges a bit, and each branch grows longer. You can follow the sets of "rings" on a branch to see how much annual extension there has been in preceding years and study the effects from past pruning, rainfall, and fertilization. Ten to 12 inches of annual extension growth is about right for mature fruit trees. You should do most of your pruning during the dormant season—after the leaves have fallen from the trees but before new growth starts in the spring. 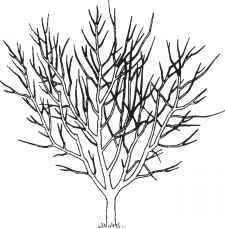 The ideal pruning time is usually from February to April. (Pruning in early winter can sometimes cause injury.) Other training tasks are carried out in the spring and summer. Older trees sometimes need additional pruning in the summer, but pruning too late in the season can encourage growth that won't harden off by winter and can weaken the tree. Many people tend to prune too much. Prune what needs pruning, but don't overprune, either (Figure 5). Too much pruning can cause excessive vegetative growth at the expense of fruiting. Pinching—removing growth near the apical meristem (the growing tip of a shoot) while it is still young and succulent. Heading—removing some, but not all, of a branch or shoot (called a shortening cut on older wood). Thinning—removing an entire shoot at its point of origin (called a renewal cut on older wood). February to April is the best time to prune apple and pear trees. Normally, when pruning trees of all kinds, you make your cut flush with the branch collar that forms where the shoot meets the branch or trunk. Where larger branches meet the main trunk, it's important to undercut the branch a few inches away from the trunk, then finish the cut from above. Remove the stub by cutting close to the branch collar. This helps prevent damaging the bark on the trunk. Figure 5. Thinning cuts (removing branches at their base) are usually better than heading cuts (removing the ends of branches). 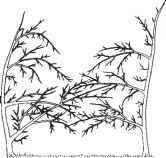 Here, branches from two adjacent trees are crowding each other. Incorrect pruning: Numerous heading-back cuts (a) stimulate undesirable vegetative growth in the vicinity of the cuts and result in loss of fruitfulness farther back on the branches. 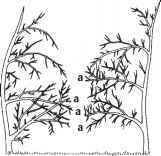 Correct pruning: Removing the large branch (b), eliminates crowding without stimulating undesirable vegetative growth. Do horizontal branches bear more apples then verticals? How to prune peach trees mature?